There are rooftops like this all over Brooklyn and other cities in America. They have long been whimsically referred to as “tar beaches”. Bucolic Bushwick is a creative Brooklyn blogger and rooftop gardener who is doing something very productive with her tar beach. She is growing food in a combination of purchased and homemade sub-irrigated (aka self-watering) planters. This is an album of her rooftop garden photos. They are a model for tar beaches all across the country. This tar beach gardener is among the rapidly increasing number of city dwellers who are discovering the benefits of sub-irrigated portable planters and are blogging about it. They are one of the most significant voices we have to counteract the silence from our institutions that should be leading us but are not. Without this grass roots effort, we would know little about arguably the most efficient way for the majority of us to grow food in the city. It produces the most vegetables per square foot while saving water and valuable time without fear of soil borne contaminants. Bucolic Bushwick is also an artist in another light. An article about LED lighting titled Green Promise Seen in Switch to LED Lighting made the front page above the fold in the New York Times. There are still questions to be answered and problems to be solved but it appears that LED residential lighting is in our future. That is good news for the future of urban greenscaping. Studies suggest that a complete conversion to the lights could decrease carbon dioxide emissions from electric power use for lighting by up to 50 percent in just over 20 years; in the United States, lighting accounts for about 6 percent of all energy use. Drop this food container reservoir into the bottom of a utility bucket and you'll have an instant sub-irrigated planter. Or, use it inside any watertight container to grow any plant of your choosing be it edible or decorative. It looks a bit grungy in the photo because it was buried inside a milk crate planter last summer. The soil wick in the center is a deli container, which just happens to fit under the cover. It has holes poked all around the bottom edge to allow water to rise by capillary action. The fill tube is made from flexible plastic tubing. It holds about one gallon of water. If you're using this outdoors remember to make an overflow drainage hole in the bucket or other watertight planter. Originally, the container was the packaging for cookies from Costco. Unfortunately, the brand was discontinued. Fortunately, I ate many of those cookies and have many of these containers. If these food containers were more widely available, it would be my recommended reservoir method for home made sub-irrigation planters of many types. Tell us if you know of a food product that comes in this type of container by posting a comment. Grampapa (screen name) on Dave' s Garden posted a very informative article about her experiences growing a variety of vegetables in Self-watering Patio Planters from Gardener's Supply. There are many photos showing the progress of her box garden plantings. For those of you with small spaces, no yard, or no urge to dig in the dirt, I am here to tell you that you can still grow a large variety of vegetables for your kitchen. My 'patio farm' was a great success this year. Let me tell you about it. The self-watering planter (26"x19") from Gardener's Supply wa my container of choice. 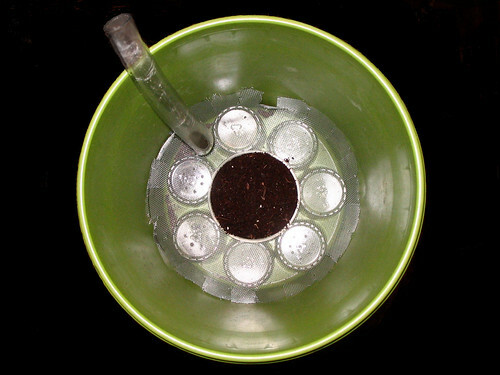 There are other, similar planters, such as Earthbox® and homemade clones which would probably work just as well. Rolling carts are available as an accessory to my planters, so I have several of them raised up to table height to make watering and picking easier for me. This is an excellent option for handicapped individuals to explore. A beehive has joined the sub-irrigated buckets on Heidi and Art's rooftop garden in Chicago. How cool is that? Check out the decking and walkway. Art does nice work, that's for sure. It's the bees’ knees. Anyone old enough to know what that expression means? We have rooftops all over Brooklyn waiting for this to happen. Very soon, we'll have at least one Brooklyn green roof grower couple to blog about. They're working on it. Stay tuned. Viewing this video was most inspiring. Robert's presentation teaches that all of us, young and old, from all lifestyles can dream and then help make the dream come true. One day there will be vegetable gardens all over the five boroughs of New York City and they will thrive with no need for tillable land. Some gardens will be elevated just like the Highline and others will be in places where no one thought there could be a vegetable garden. Like the Highline, these gardens will demonstrate the marriage of technology and nature in the built environment. Who knows, perhaps there will be some tomatoes growing in modern age portable planters on the Highline in the future. As you read this, there are dreamers joining the parade each day. While we dream, we also know that we need to march to turn the dreams into reality. Come join the parade. You will be most welcome. News Release Caption: The EarthBox is a container garden that is an easy planting and growing system for gardeners. This planter gives gardeners who live in apartments or don't have the space or quality soil to grow a successful vegetable garden. Gardening is a hobby in which there are many practices and techniques passed from one generation to the next, some that have never been researched or challenged. Also, because gardening is a multi-million dollar a year industry, there are countless gadgets and gimmicks that claim to make the job easier, improve yields or simply beautify the landscape. It is often difficult to separate facts from "old wives tales" or marketing schemes. This week's Reiman's Pick -- the EarthBox -- is a concept in container design and plant culture that really does makes gardening easy and nearly foolproof. An interesting (and unexpected) hit I discovered on a search of all 50 Extension Program websites was this well written news release about the EarthBox. It was written by the extension coordinator at Reiman Gardens, an Iowa State University botanic garden. What is most interesting is that it was released in April, 2004. Five years later, any trace of the subject has now mysteriously disappeared. Even though public interest in vegetable gardening has increased dramatically, Reiman Gardens site searches now produce no hits on the words earthbox or self-watering. Does this represent a hidden agenda or unpublicized USDA Extension Program policy? I wonder who makes these decisions? Whatever the reasons for extension program inattention to the subject of sub-irrigated box, bed or bucket gardening, it is taxpayer money that is involved and we deserve to know the reason. It isn't Frank Meuschke's fault that he became an involuntary lead miner. He was just trying to grow vegetables. Place the blame squarely on the shoulders of outdated horticultural methods that don’t take into consideration the realities of urban food gardening. Good old dirt may be a good idea out in the country, but not in the city where most of us now live. Locavores and foodies take note: local food shouldn’t be hazardous to our health. If you’re not aware of the urban contaminated soil problem, read this NY Times article titled Lead Is a Concern for Urban Gardens. It’s an alarming story of the dangers of contaminated city soil and edible gardening. Note that even though growing food in sub-irrigated (aka self-watering) planters, boxes, beds, buckets, and other containers is an obvious solution to the problem of contaminated city soil, there’s not one word about it in the article. Think of sub-irrigated growing as safe gardening—because no native soil is ever used. It is lead-free gardening at its easiest and should be the first-choice method for most of us living in the city. You might wonder why a NY Times investigative reporter doesn't know about lead-free urban gardening. It's easy for me to understand because I research the subject daily via the more than 800 RSS feeds streaming into my computer. These feeds coupled with Google site searches show clearly that our horticultural and botanic institutions are teaching outdated methods based solely on native-soil gardening and drain-hole watering. It’s cave dweller stuff, but unfortunately it’s the information most accessible to the mainstream media...and therefore to urban gardeners. Links for consumers, journalists and bloggers that shed some light on a dark subject. If you are a consumer, an investigative reporter, journalist or blogger searching for the truth about modern urban gardening and agriculture, investigate the following links (after the jump) and you will be well on your way to a complete understanding of this important subject. The subject has a direct connection to the challenges of local food production and green job creation we are trying so hard to resolve. This is the version of the sub-irrigated (aka self-watering) 5 gallon bucket planter that I'm going to use this season. Note that it is made from just one bucket. The two (sleeved) bucket version is in more widespread use on the web but I don't agree that it is necessary. Even if you can find them free, why waste a valuable bucket if you don't have to. Instead of a rigid material requiring the drilling of drain/aeration holes this soil platform is made from aluminum window screening. Upside down plastic party cups support the screen platform. These could just as well be recycled food containers or cut from plastic water bottles. Cut them with scissors to create the height of the water reservoir. 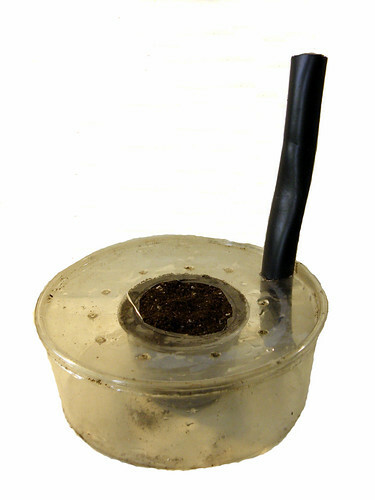 The soil wick is formed with a deli container. It could be a yoghurt, sour cream, butter or other food container of this type. The objective was to design a bucket planter that doesn't require the use of power tools. You can make this planter with a pair of scissors. Soon there will be heirloom tomatoes, peppers and other delicious vegetables produced by these easy-to-make sub-irrigation planters. They will out produce in-ground and raised bed drip-irrigated plants while saving water and your valuable time. It's the modern green way to grow. It was good to see that the McGill University edible campus garden is continuing into 2009. The project is a partnership with the Rooftop Garden Project, also in Montreal. This is my model of what a 21st century community garden should look like. They have done an outstanding job of documenting the project with pictures. It is a joy to see the campus and community involvement that includes both the young and old. The Rooftop Garden Project is a leader in the use of recycling to make sub-irrigated planters of many configurations. For example, you can see tote boxes and half barrels in the photo above. More information about the Rooftop Garden Project. More about the McGill University edible campus.